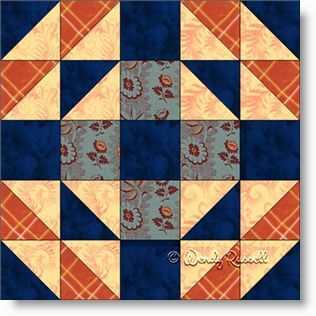 The Handy Andy quilt block is a nice introduction to the half square triangle patch, probably the most commonly used patch in quilt blocks (after the square, of course). This block is frequently made as a 10" block because the math works out nicely. However, I have included instructions for several different sized blocks as well. The patches are sewn together in rows of three sections, as an uneven nice patch, so named as the three rows are not all the same measurements. The sample quilts illustrated show how you can simply turn this easy quilt block into a really stunning quilt.